A pump, a couple of wires, and a couple of tubes is all it takes to get outdoor AC. I know this sounds a little nutty, but it’s true: you can put air conditioning on your small center console, more or less, with a mere $300 and an afternoon of work. I say “more or less” because what I’m talking about is a misting system, not actual AC. But if you’ve ever stood under misters before, then you know that it really does feel like air conditioning. And on a blistering-hot 100 degree day with no breeze, at the flip of a switch, standing on the deck of your boat it’ll feel like a cool 70 degrees. 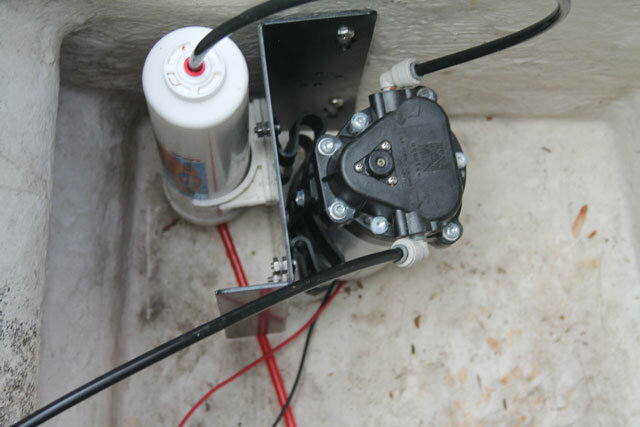 The best thing about a mister system is that it’s inexpensive, and easy to install. I put one on my 22 center console in about three hours. All you have to do is mount a pump, within a few feet of somewhere you can put a jerry can of water. Wire in power, then run the straw-sized tubing from the pump to the T-top, up a leg, and around the top’s perimeter. For securing this line, all you need to use is plastic zip-ties. Next, cut the tube where you want to install a misting head. Installing it is as easy as pushing either end of the tube into each side of the head, until it clicks in place. With the system in place, you can expect to get several hours of “ahhhhh” out of a five-gallon jerry can. I installed a mister head on each corner of my T-top, and I find that on breeze-less days it keeps everyone in the helm area plenty cool. I mention breeze-less in specific because when there is a decent breeze blowing, most of the mist blows away before it comes down on the boat’s occupants. Of course, when there’s a breeze everyone isn’t really sweltering in the first place. Plastic zip-ties hold the tube and mister heads in place. 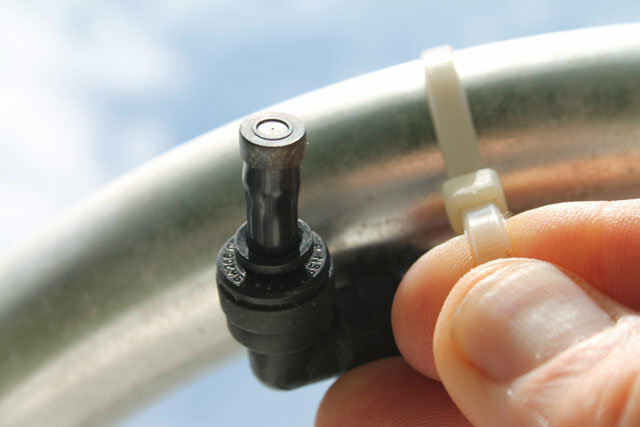 If you want to look into adding a mister system to your boat—and if you have a T-top or arch and are sick and tired of sweating all the time I suggest you do—just Google around a bit. There are plenty of options out there, including hand-pumped, self-contained systems (though IMHO, these aren’t nearly as nice as systems you can mount on the T-top, flip a switch, and forget about). Believe me, you won’t regret it.